This is the beginning of a new series of posts I'm going to be writing, featuring just one brand at a time. I'm aiming to do this on a weekly basis. All products mentioned are linked to the Origins website. My first Origins purchase was the 'Super Spot Remover Blemish Treatment Gel' (£14/10ml). This was recommended to me by an Origins assistant as I was dealing with quite a lot of breakouts at the time. It contains Salicylic Acid, which is common in most spot treatments, and it helps to exfoliate the top layer of skin, clear excess oil from the pores, and speed along the healing process. It's also packed with Red Aglae, which helps to reduce redness. I dab a spot of this onto any blemishes I can feel appearing before bed, and more often than not, by morning, they're greatly reduced in size. Another product recommended to me was the 'United State Balancing Tonic' (£18/150ml). I find it hard to see whether toners actually do anything for my skin, but this one smells lovely, and is extremely refreshing to use after cleansing. At first, I had my eye on the 'Zero Oil' toner, as I have fairly oily skin, but I mentioned that I don't like my skin to feel stripped, so a balancing toner sounded like a perfect compromise. I use this daily before moisturising, and I find that it really does help to keep oil at bay, without making my skin feel tight. Next up, we have the masks. Origins masks really took off last year, with pretty much every blogger singing their praises, and I can see why! I'd been keen to try these masks ever since Kate from gh0stparties mentioned a few in her posts, and I sure am glad I did! These masks retail at £22 each for 100ml, but I was lucky enough to grab the mask gift set, which featured three 75ml versions for just £23 - amazing! My top two out of the four would be Drink Up Intensive, and Out Of Trouble, as I feel that these two give the most noticeable results straight away. When my skin is feeling particularly dry, I like to leave Drink Up Intensive on overnight, as it soaks in quite well, and gives me such wonderfully moisturised skin - there's nothing quite like it! Drink Up 10 Minute is similar, but just not quite as rich. Useful if you need a quick surge of moisture. Lastly, Clear Improvement. This is hands down, the best 'clean up' mask I've ever tried. Packed with active charcoal, this mask promises to rid skin of impurities and clear out pores. It helps to draw nasties to the surface, so don't be alarmed if you notice you break out slightly after using this. It's just doing it's job. I'd been looking for a moisturiser with a little bit of SPF in for a while, as I often forget to apply sunscreen before my makeup. This ''A Perfect World' SPF 25 Age-Defense Moisturiser' (£34/50ml) sounded right up my street. Although aging skin is not a concern of mine yet, it is the reason I strive to stay protected in the sun. It is oil free, and smells gorgeous! Despite the SPF, it's not greasy in the slightest, and goes on better than any moisturiser I've tried in the past. This one is a firm favourite, and I'll definitely be repurchasing it when I run out. The last three products I'm going to talk about were all free samples. I don't think I've ever made an order with Origins and NOT got something free!! Much to my delight, I received a very generous pot of GinZing Refreshing Eye Cream (worth £23/15ml) when I spent over £20 on my first purchase in-store. I absolutely love this! It's so brightening, and really helps to disguise any dark circles under the eyes. Next is the 'Make A Difference Plus+ Rejuvenating Moisturiser'. (£34/50ml) I really like this moisturiser as it can be applied in the AM or PM. It goes on really smoothly, and isn't too thick. I've only had this a matter of weeks, but having swapped it with my usual night-time moisturiser, I've noticed that my skin looks a lot more supple in the morning. Last, but not least, is the 'Modern Friction Dermabrasion'. (£33/125ml) I've only used this once so far, as I don't like to over-exfoliate my skin, but this is surprisingly gentle! My skin did look brighter after use, and I'm looking forward to trying it out again. Thank you very much for reading, and I'd love to hear what you think down below! :) Have you ever tried anything by Origins before? 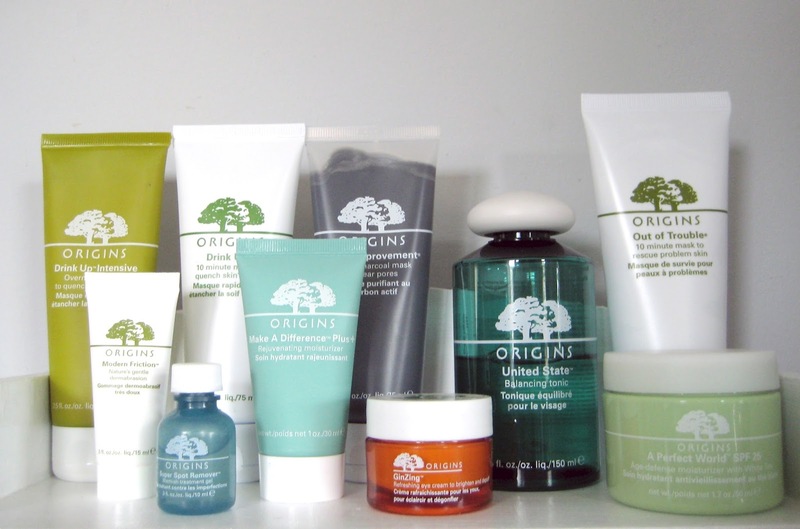 I love love love Origins products! I am in envy of your Origins collection. I adore the brand and really want to try the Out Of Trouble mask. I love Origins. It is truly gentle on skin. I really want to try the mask! You should give the La Roche Posay Effaclar AI a go if you're interested in the spot gel - I find it packs a slightly bigger punch! Wow you have a lot of Origins haha - love their stuff. I must must must try something from Origins - particularly the Clear Improvement mask! It sounds incredible, and I could really do with a good mask to clear up my skin! I have never gotten round to trying their products before! :O I've heard so many good things about the brand but I can't find it anywhere in my area so I would have to order it online. I am definitely going to try them soon!